Taxi applications on the App Store are a dime a dozen, but for the most part they’re just glorified phone directories that don’t really make it any easier to call a cab. Taxi Magic, a new app that recently went live on the App Store, is doing what the others can’t: on-demand cab service from your iPhone at the push of a button. The application connects directly into Taxi routing systems, allowing users to book cabs without ever needing to speak to an operator. The service is available in over 25 cities across the US, including San Francisco, Los Angeles, and Washington DC (oddly enough New York seems to be excluded for now). Ordering a cab is fairly simple: after launching Taxi Magic, your iPhone will use GPS or triangulation to determine your general location, and will present a list of nearby cab services (some listings are only phone numbers, while others fully support Taxi Magic’s ordering system). Update: Apparently NYC is excluded because no booking systems for the cabs are available. After choosing a supported cab company, the application will ask for your exact street address and will then take you to a status screen that will alert you once your ride is dispatched (wait times can vary depending on the time of day and location). 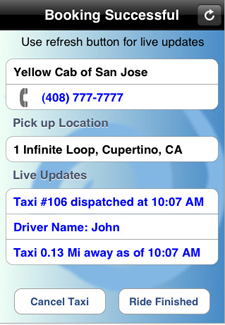 The status screen also allows you to view how far away the cab is and the driver’s name. I’m looking forward to using Taxi Magic next time I need to hail a cab, but I still have a few gripes with the program. For one, the interface could use a facelift – the funky blue background makes it look like an amateurish effort. It would also be nice if the application could send SMS alerts to inform me when my cab was on its way, and some kind of wait time indicator would also be handy. Finally, the app should integrate some of the features found in other Taxi apps on the App Store, like toll estimates based on the distance you’re traveling. Taxi Magic was made by RideCharge, a startup geared towards frequent cab users who can book their taxis on the web and pay for them using their mobile phone. The site also makes it easy for businesses travelers to produce expense reports for their cab rides.